PV Module Cleaning – does it pay back? Many photovoltaic plants in Germany are exposed to heavy soiling. This ranges from PV plants that are located next to very busy streets exposed to extreme pollution or bird droppings. Pollution causes yield losses and in some cases irreversible damage to the modules if the contaminants are not frequently removed. From a technical perspective cleaning of PV modules makes a lot of sense in most cases, but does it calculate for the PV owner? There are numerous reasons which are responsible for the contamination and the self-cleaning during rainy days will not remove all dirt in most cases. And the effect of self-cleaning is highly dependent on the slope of the modules – the smaller the angle of the slope, the less the effect will be. Further, the design of the modules also plays a crucial role. For example when you look at frameless PV modules the running water leaves less sediments at the edge the module. If PV modules are exposed to one or more of the following reasons of soiling, a regular cleaning should be considered. When you decide to clean the modules of a PV system you should also assess the effect on yield improvement. 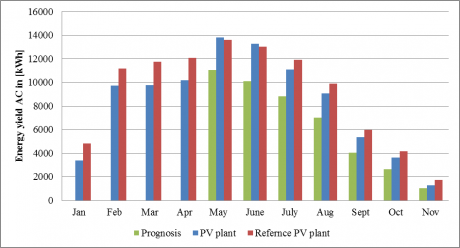 Here is an example how we looked at the impact of the module cleaning to the PV yield performance. The yield performance of a 100 kWp PV system before and after cleaning. The facility is located on the roofs of a stockyard. A nearby PV system, without particular pollution load was used as reference. Both PV systems were running without fail in the period under review. Figure 1 shows the monthly energy yield of the PV Plant (blue), the reference PV plant (red) and the prognosis for the PV Plant without cleaning. The PV plant was cleaned on the 24th of May. After cleaning a significant yield increase of more than 15 percent was measured and only two months after the cleaning the monthly yield dropped again below the reference and continuously degraded over time. The green bars show a prognosis for the expected monthly yields if no cleaning would have been performed. The monthly yield improvement caused by the cleaning for the period from June to December adds up to 11.000kWh. In the case of a feed-in tariff of 0.33 €/kWh, this corresponds to 3,630 €. The cleaning cost for the 100 kWp PV system is 1,430€. The profit gained seven months after the cleaning service is already 2,200 €. The PV owner smiles.